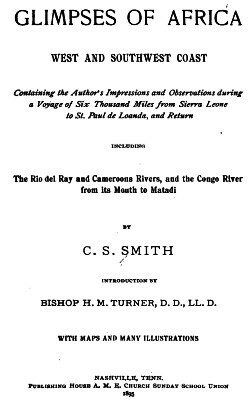 C. S. Smith : Batanga Canoes, West Africa, 1895. A. M. E. Church Sunday School Union, Nashville, 1895. A brief description of the canoes and techique of the Batanga on the west coat of Africa. In particular note the use of one foot to enhance balance or, occassionally, used to propel the craft. The Batanga people, though not always living on the seaboard, have become noted canoemen. They have two kinds of canoes. One is made of cork wood and very light, and intended only for one person. The other is made of hard wood, and is smooth and tapering at both ends, but is large enough to carry thirty or forty people. The smaller canoe does not weigh more than twenty or thirty pounds, and is too narrow for an ordinarily sized person to be seated in. than two inches wide, and somewhat higher than the sides of the canoe. They use very light paddles, and scud over the roughest sea without danger and with almost incredible velocity. They propel chiefly with the left hand, use one foot as a balance, which they continually keep in the water, and when necessary use the right hand to bail out water; and when they would rest their arms, one leg is thrown out on either side of the canoe, and it is propelled almost as fast with their feet as with the paddle. When tired of running around the ship a man will climb up her side with one hand, and haul up his canoe with the other. When they approach a ship from the beach they look somewhat like a flock of blackbirds. I weigh one of their canoes, and it weighs twenty-seven pounds. Geoff Cater (2013) : C. S. Smith : Batanga Canoes, West Africa, 1895.